ANCHORAGE, Alaska (AP) — As Royal Dutch Shell PLC seeks permits for exploratory oil drilling off Alaska's northwest coast, a federal agency has concluded the company underestimated risk the last time it moved drill rigs to Arctic waters. 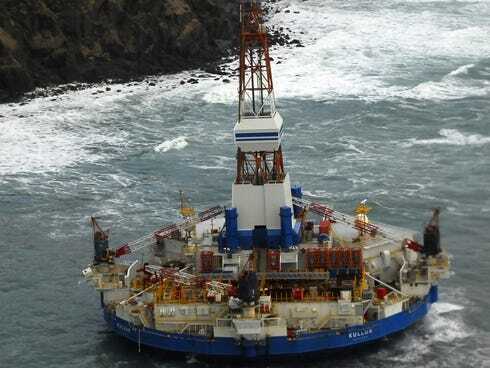 A National Transportation Safety Board report issued Thursday said the probable cause of the grounding of the company's mobile drilling vessel, the Kulluk, in 2012 was "Shell's inadequate assessment of the risk for its planned tow" across the Gulf of Alaska. Shell spokesman Curtis Smith said by email the company is reviewing the report but has already made changes and "engaged extensively with the regulators on that topic." A revised operations plan provides more oversight of contractors and better access for contractor employees to tell Shell how to improve operations, he said. The company also took the recommendation of the Interior Department and used a third-party auditor to review its 2015 operation plan, Smith said. An audit of operations in real time also is planned. In 2013, NTSB representatives sat in on weeks of inquiry led by the Coast Guard, which concluded last year that poor risk assessment and management were among factors that led to the grounding of the rig. Shell officials have regularly pointed out that the company's 2012 problems were tied to transportation issues, not drilling. The company hopes to resume exploratory offshore drilling this year in the Chukchi Sea. The Interior Department is in the process of deciding whether to grant the necessary drilling permits to Shell. Smith says there is no correlation between the grounding of the Kulluk and the remaining permits needed by Shell for that drilling. Arctic offshore drilling is strongly opposed by environmental groups in the region threatened my climate change. Critics say oil companies can't clean up major spills, especially in cold, dark, remote Arctic waters far from shore-based infrastructure common in offshore drilling areas such as the Gulf of Mexico. Petroleum companies want to tap reserves estimated by the U.S. Geological Survey at 26 billion barrels of recoverable oil. Shell in 2012 used the Kulluk to drill in the Beaufort Sea and the Noble Discoverer to drill in the Chukchi. At the conclusion of the open water season, Shell towed the Kulluk, a conical barge 266 feet in diameter, to Dutch Harbor in the Aleutian Islands. The Kulluk, behind the 360-foot Aiviq, on Dec. 21, 2012, departed Dutch Harbor for a Seattle shipyard. The tow plan called for staying within 200 miles of the coast, allowing for easier search and rescue, despite the potential for rougher water. On Dec. 27, as sea swells reached 25 feet, the tow line broke. Within five hours, mechanical problems shut down the Aiviq's four engines.